Be a part of this unique project! Purchase a tile for your family, your loved ones, your organization…to mark a special occasion, anniversary, birthday or family addition. This spectacular 11’ x 21’ Donor Wall, located in the lobby of the Heritage Centre, is engraved with the names of our generous donors and is one of the many unique exhibits to see in our facility. Since 2004, families, individuals and businesses purchased ceramic tiles in support of the Heritage Centre and our initiatives to preserve and promote the area’s rich history. The wall is composed of 1,106 tiles featuring a mosaic of the northern lights, designed by local artist Cheryl Wilson-Smith. Don’t miss the chance to have your name as part of this wall and leave a piece of your family’s legacy in Red Lake! The Donor Wall Album includes stories of the individuals, families and businesses who have purchased tiles and accompanies the wall as a permanent display, adding a personal touch. 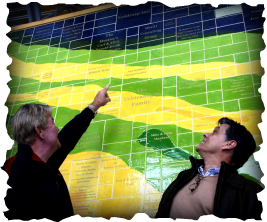 To date, over 60 stories have been contributed to the Donor Wall Album and are on permanent display at the Heritage Centre. Please email us if you would like to include your story in our Donor Wall Album. Thank You to All of Our Donors and Supporters!